The Omnipure K-Series K2533-JJ filter is a post R.O. acid washed GAC inline water filter. This filter has 1/4 quick connect fittings that make it really easy to install and replace. This filter can be used in ice makers, refrigerators, beverage equipment, drinking fountains, under the counter systems, R.O.Systems and in conjunction with purification systems. 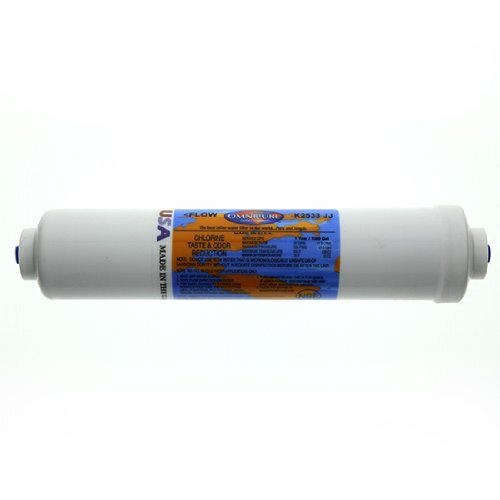 This filter also aids in the removal of taste, odor and chlorine taste and odor. Dimensions: 2" W X 10" LFlow Rate: .5 GPMMaximum Pressure: 125 PSIGMaximum Temperature: 100 FService Life: 1 Year or 1500 Gallons Filtration Media: Granulated Activated Carbon Volume Cubic Inch: 18.5Fitting Size: Quick-Connect 1/4" fittings Omnipure K2533-JJ has been tested for performance under NSF Standard 42. If you have any questions about this product by Omnipure, contact us by completing and submitting the form below. If you are looking for a specif part number, please include it with your message.